Glenn on the Secret Wars announcement at Biff Bam Pop! Pingback: The GAR! 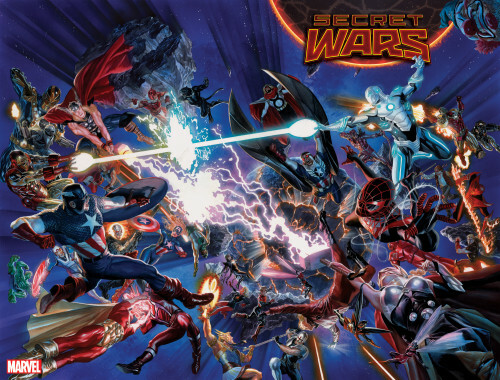 Podcast: Secret Wars | Biff Bam Pop! I’ve finally caught an episode. Congratulations on the run. Not being as versed where Ray stands as a fan, he’s an enjoyably refreshing contrast. Given the subject, I listened to this episode twice. And I took notes. That being said, there are a few things I’d like to say (mostly to Glenn). As a writer and fan, I respect your right to an opinion and your ability to articulate such. The post-conference piece you wrote for BiffBamPop the other day was decidedly middle-of-the-road informative (despite factually questionable points I brought up there). This was a little bit more the “kid gloves off” editorial of what you really think. However, I failed to find anything constructive from what you brought to the table here. Over the years, it’s been no secret that you & I usually fall on opposite sides involving the Avengers (& evidently, Marvel at large). I was wondering what happened to your reviewing of the monthlies and if I inferred correctly from your grumblings, you gave up. That’s entirely your prerogative. It’s quite obvious from this episode that big name comics haven’t filled you with idyllic joy in some time. Again, nobody’s taking your opinion or fundamental right to it away from you. It’s just that when you put yourself out there as an authoritative talking head, it’s disappointing to hear an offering w/ little difference from a one-line kneejerk anonymous message board troll. Ray’s gauge on your attitude seems fairly accurate (from the standpoint of how you publicly portray it). Regarding your retro fixation, I agree w/him that there is something wrong with holding onto the past so tightly. Particularly when it chokes off all the future joy you or anyone else may get. Specific to comics, nobody’s taking your attachment to characters/stories away from you. You read it, it happened, it matters to you as much as you choose to give it validity. As a reader, your experience is entirely on YOU, though. Comics are a business. They are not your friend. They don’t owe any of us anything, quite honestly. They also shouldn’t have to apologize for being more popular and directly in our mass culture now more than ever. If I’m mistaken about any of this, I invite you to take me to task. Next Next post: GAR Podcast Episode 87: Sports?! ?